A jellyfish’s lifespan usually ranges from somewhere between a few hours, for the smallest species, to several months, and rarely to a few years for the bigger species. Not so for a jellyfish called Turritopsis Nutricula. It is also known as the Immortal Jellyfish because it is the only known immortal animal on Earth and potentially lives forever! But how does the only 4-5 mm long Turritopsis nutricula manage to beat the system? Like most jellyfish, Turritopsis nutricula undergoes two distinct stages in its life cycle: the polypoid or immature stage, when it’s just a small stalk with feeding tentacles; and the medusa or mature stage. Once it reaches sexual maturity, it looks like a tiny, transparent, many-tentacled parachute (only about 5mm in diameter) that floats freely in warm ocean waters. 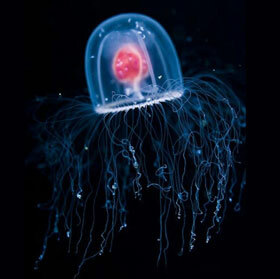 But when times get tough, Turritopsis can turn into a blob, anchor itself to a surface, and undergo a sort of reverse methamorphosis back to its youthful form as a stalk-like polyp. That’s like a butterfly turning back into a caterpillar. Scientists, who first described this phenomenon in the 1990s, believe Turritopsis can repeat its life cycle indefinitely. The trick to Turritopsis‘ infinite do-overs is a process called transdifferentiation, which turns one type of cell into another. This switching of cell roles is not unusual and can be seen in many animals and humans (e.g. salamandars can regrow limbs), but Turritopsi is the only one that can regenerate its entire body. “This species of jellyfish might be the only animal in the world to have truly discovered the fountain of youth. Since it is capable of cycling from a mature adult stage to an immature polyp stage and back again, there may be no natural limit to its life span. Because they are able to bypass death, the number of individuals is spiking. We are looking at a worldwide silent invasion”, says Dr. Maria Miglietta of the Smithsonian Tropical Marine Institute.